Bioreactor Market size is set to exceed USD 2.2 billion by 2025; according to a new research study published by Global Market Insights, Inc. Rising chronic disease prevalence and growing research in the field of biopharmaceuticals will drive the global bioreactor market size. Increased focus of biopharmaceutical companies to develop effective treatment options for the most orphan diseases should fuel industry growth. Personalized medicines are changing the way many diseases are identified, classified, and treated. Increasing number of personalized medicines targeting a specific population will further boost the industry expansion. A new manufacturing technology has evolved to provide more personalized drug products such as 3D bioprinting. Technological advances in manufacturing technology should improve flexibility, quality and scalability of operations with low capital and energy requirements. Innovative methods and analytical tools should improve process robustness, accelerate scale-up to industrial production and drive efficient use of resources. Biopharmaceutical products are individualized products with highly specific manufacturing requirements. Advanced biopharmaceutical manufacturing technologies have enabled development of effective drug delivery systems and drug device combination products. Increased collaboration in biopharmaceutical industry through partnerships with medical device manufacturers, diagnostic developers, academic institutions should propel business growth. Mammalian cells attributed for significant revenue share with its market size estimated to exceed USD 1.7 billion by 2025. It is widely used owing to its preference to product complex therapeutic proteins and enhanced compatibility for posttranslational modifications. Monoclonal antibodies (mAb) held more than 35.0% revenue share in 2018 owing to increasing use in medical therapeutics attributed to its long half-life, high specificity, predictable pharmacokinetics, low toxicity, and high dose demand. The mAb therapeutics segment should flourish over the forecast years due to promising industry pipeline. Single-use bubble column bioreactors should witness over 18.0% CAGR over the forecast years. It is extensively used for cell line development, process development, and clinical trial manufacturing wherein they enhance the overall speed and effectiveness of media and cell line development. Wide industrial application, effective design and efficient hydrodynamic and operational characteristics should gain the considerable business share. U.S. bioreactor market was valued over USD 230.0 million in 2018 and is anticipated to witness significant growth over the coming years due to increasing number of biopharmaceutical companies focusing on new drug development processes and growing number of strategic collaboration with academic institutions and venture capital firms. 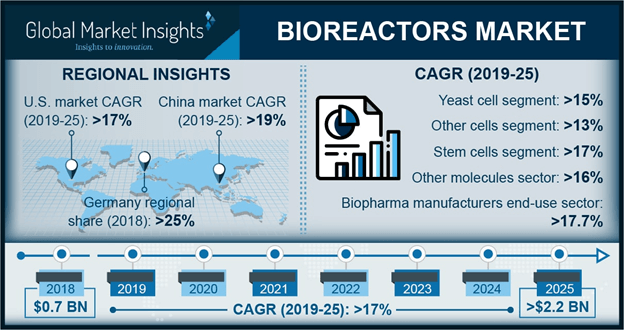 UK bioreactor market will witness over 17.0% CAGR, owing to high healthcare spending and presence of large number of industry participants in this region. Increasing government initiatives to promote economic growth and improved quality of life should also drive industry growth. Asia Pacific will experience significant growth due to a trend shift from traditional methods to new production methods of monoclonal antibodies, recombinant proteins, and cell culturing by using advanced bioreactors. High demand for single-use bioreactors with continue to stimulate regional industry growth. Some of the key industry players operating in bioreactor market include Eppendorf, GE Healthcare, Merck Millipore, Sartorius, and Thermo Fisher Scientific. Industry participants are engaged in strategic collaborations, mergers and acquisitions coupled with new product launches in order to achieve competitive edge in the market place.